Today is my 27th birthday. Wow – 27. How did that happen? You know when you are a kid and you imagine your life a certain way? For me, I always modeled my life after my mom’s, but I would throw a couple of my own twists and turns into the mix. I thought I would get married at 25 – just like my mom. I thought I would have my first baby at 28 – just like my mom. Then things got kind of out of control and I thought that I would have like 4 kids and live on a farm in a cute white house with wood floors. I thought I would still have horses. I thought I would marry one of the boys from my hometown. Oh my my, sometimes things do work out for the better, don’t they? I love my life. I love my amazing friends. I love that I have fulfilling, meaningful work. I love my fiance more than anything. I’m ridiculously lucky and so grateful. 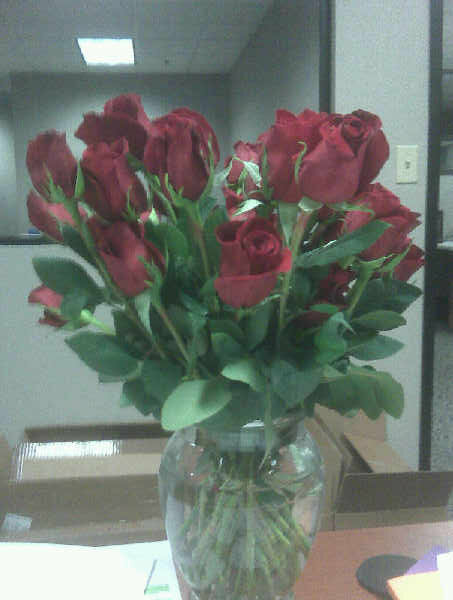 Call me a traditionalist, but there’s nothing like red roses. Sorry for the picture quality – damn Blackberry. I’ve been feeling a little neglectful lately so I decided that I would do the 14 Days of Valentines for my Valentine, Travis. For those of you who have never heard of the 14 Days, it is similar to the 12 Days of Christmas. For the 14 days leading up to Valentine’s Day you shower your beloved with fun little presents. Day 1 was a box of chocolates and Day 2 (today) was a book of coupons that he can redeem for things like an all-you-can-eat sushi dinner, a month of laundry or a back rub. I’ll post pictures when I get a chance (of the book, not the back rub). Travis is an amazing catch and I’m trying to not get too self-absorbed while planning our wedding. He’s the most important thing in my life and 14 Days of appreciation is the least I can do to make him know how important he is to me. I will keep you posted and add photos of the gifts as we move closer to Valentine’s Day.